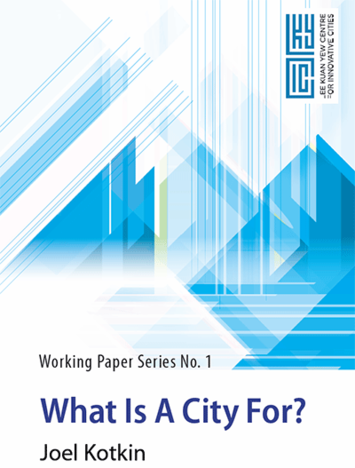 What is a City For? The attached report is derived from a speech given last spring in Singapore at the Singapore University of Technology and Design. The notion here is to lay out a new, more humanistic urban future, not one shaped primarily by large developers, speculators and transient global workers. Singapore was a particularly difficult case to look at since it has no room to spread out, something we still have in much of the rest of the world. Yet the city has been very innovative in the development of open space, and its public housing agency, the Housing Development Board, has worked hard to accommodate the needs of families. I have been struck by how people in different countries want the same things: safety, space, privacy, convenience, and affordable housing. The speech is a call to reconsider our urban priorities and make the city responsive to its denizens. Download the full .pdf document. What is a city for? In this urban age, it’s a question of crucial importance but one not often asked. Long ago, Aristotle reminded us that the city was a place where people came to live, and they remained there in order to live better, “a city comes into being for the sake of life, but exists for the sake of living well” (Mawr, 2013). However, what does “living well” mean? Is it about working 24/7? Is it about consuming amenities and collecting the most unique experiences? Is the city a way to reduce the impact of human beings on the environment? Is it to position the polis — the city — as an engine in the world economy, even if at the expense of the quality of life, most particularly for families? I start at a different place. I view “living well” as addressing the needs of future generations, as sustainability advocates rightfully state. This starts with focusing on those areas where new generations are likely to be raised rather than the current almost exclusive fixation on the individual. We must not forget that without families, children, and the neighbourhoods that sustain them, it would be impossible to imagine how we, as a society, would “live well.” This is the essence of what my colleague, Ali Modarres and I call the ‘Human City’. Living well should not be about where one lives, but how one lives, and for whom. Families can thrive in many places, but these bearers of the next generation are not the primary focus of much of the urbanist community. I am referring here to urban neighbourhoods like in Singapore or in the great American cities, as well as the country’s vast suburbs. These are not necessarily the abodes of the glittering rich, or the transitory urban nomadic class, who dominate our urban dialogue, but a vast swath of aspiring middle- and working- class people. They are not necessarily the places that hipsters gravitate to, or lure people thinking of a second or third house. Submitted by ScottZwartz on Fri, 12/27/2013 - 20:25. A city is a place where the vast majority of the citizens pay property taxes so that the city government can give those tax dollars to their friends to build huge mixed-use projects and then use more tax dollars to bail out their billionaire friends when their projects are financial busts. Hollywood is an excellent example how to destroy a city for fun and profit. Submitted by ScottZwartz on Fri, 12/27/2013 - 20:18.